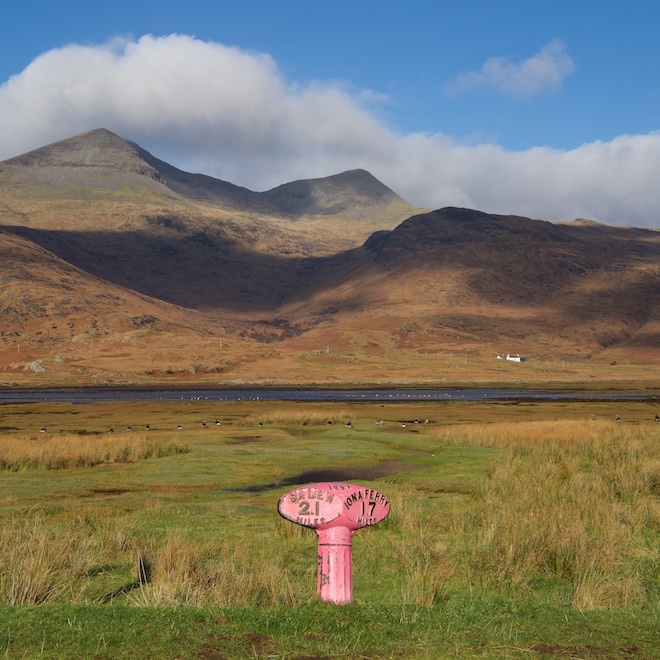 There are plenty of things you can do to make an alternative day out on Mull. 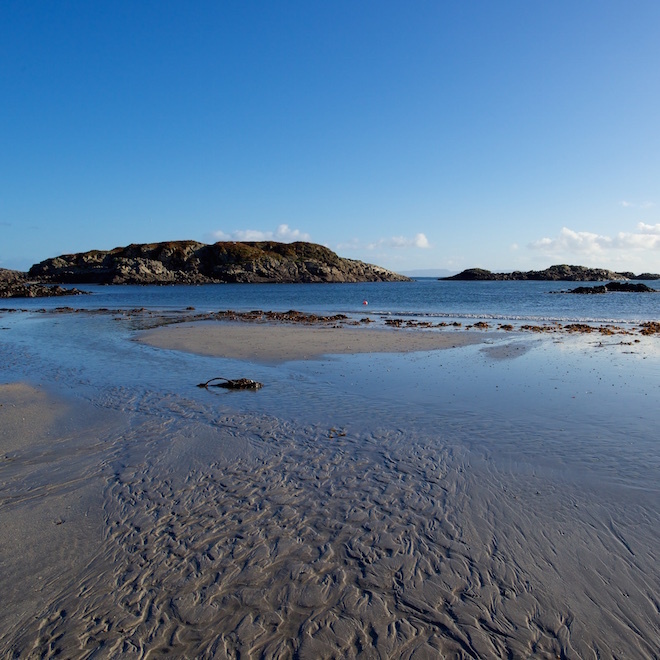 I wrote in a previous blog about the best beaches around here, and I have written in the past about trips to Iona or the Treshnish Isles. 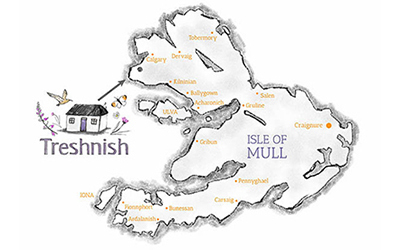 This time however I am suggesting that you go hand in hand with the Mull and Iona Food Trail! And see where it takes you. There is a Food Trail map in the cottage on your arrival, which gives you the contact details for checking opening hours et cetera. 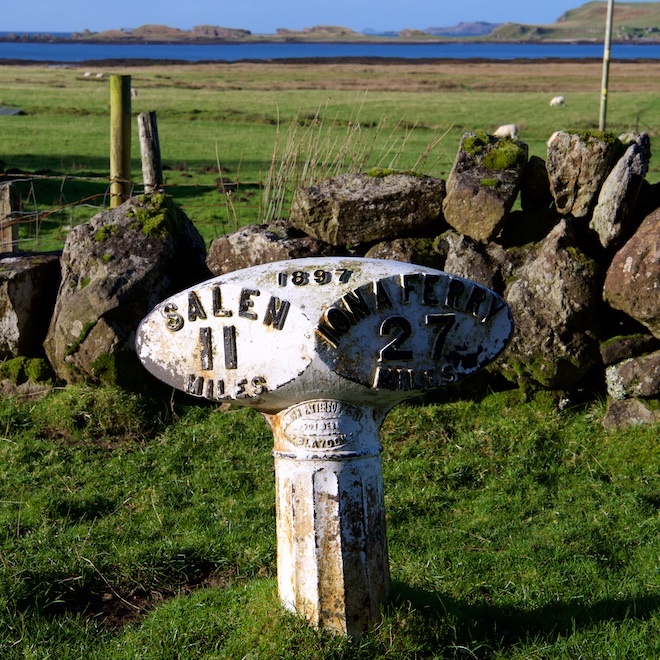 Heading to the south of the island take the wonderful drive along Loch Tuath and Loch na Keal. Look out for Loch na Keal Meals which may be open at Killichronan. They specialise in local produce, all home made. Good White tailed eagle spotting area too. Pass the church at Gruline (where we got married!). Along underneath the dramatic Gribun cliffs. The beach at Gribun is a great place to search for cowrie shells. Take a picnic of island produce from Dervaig Stores. Look out for the milestones erected in 1897! The Tiroran Hotel has opened a coffee shop in the steadings. We have eaten at the hotel itself but we haven’t been yet so please let me know what it’s like! In the summer season you can combine a visit there with the Mull Eagle Watch hide at Glen Seilisdeir (Contact the TIC in Craignure to book your visit in advance). In Bunessan you can see if the Blackbird Bistro is open. Visit the community run charity shop Castaways in Bunessan. It has a book shed round the back which is open even when the shop itself is shut! Look for the sign saying Ardalanish just outside Bunessan. See how organic tweed is made, buy their own beef and lamb – and go to the beach! In fact you can go to one beforehand and a different one afterwards, as Uisken Beach (a childhood favourite of mine) is only a mile away from Ardalanish Beach. This is Uisken photographed on a gorgeous November day. I had the beach to myself! The little Ardtun road is pretty and looking for the fossilised leaf beds makes for an alternative rough unmarked walk. You might even come across an Otter or two.. 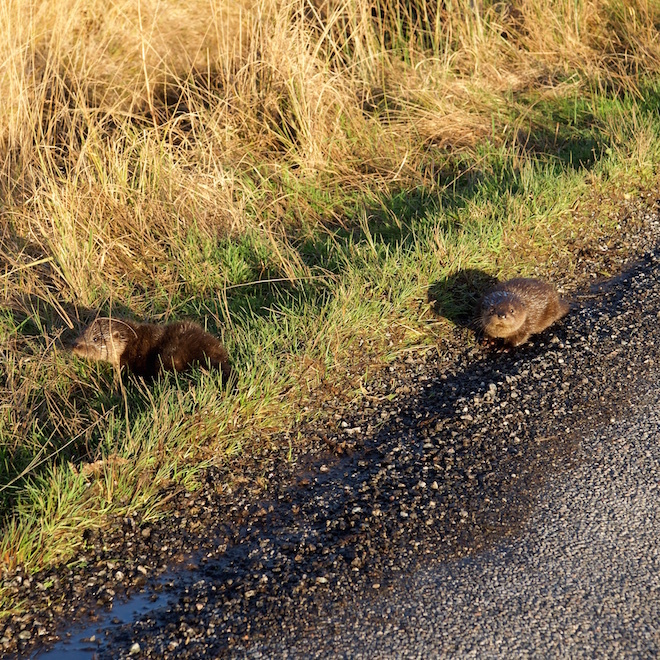 I contacted Mull Otter Group about these two babies as I was worried they allowed me to get so close – there was no sign of their mother. There are several shops on the Ross of Mull supplying island produce. Try Pennyghael Stores, The Ferry Shop in Fionnphort and The Crofters Kitchen at Kintra. The Crofters Kitchen not only sell their own vegetables and salads but a selection of Fair-trade and whole foods too. 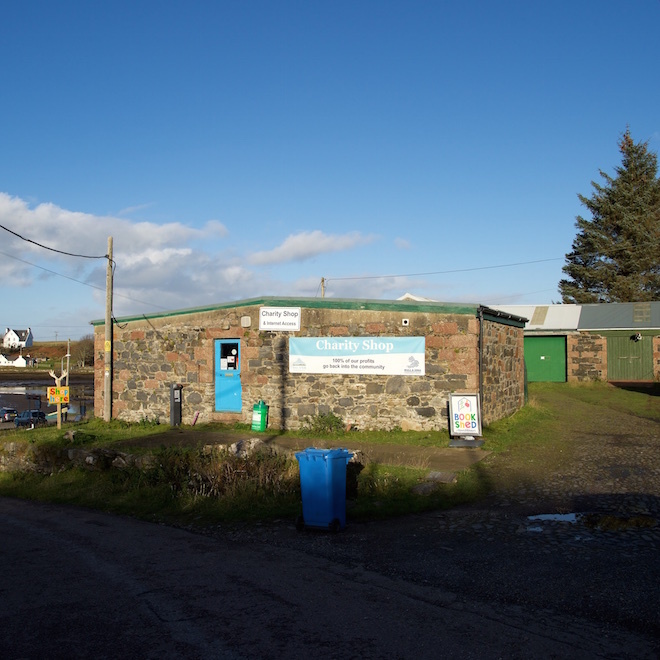 A detour to the Old Post Office at Lochbuie (open 365 days a year) would enable you to stock up on more local produce. There are lovely walks down there too. This milestone was not pink back in 1897. No one pertains to know who did painted it! Make your last stop at Inverlussa Mussels located a few miles south of Craignure. Mussels are an eco-friendly way of enjoying farmed fish without damaging the environment – like Isle of Mull Oysters grown near here. Both oysters and mussels grow in ebbing and flowing waters. No supplementary feeding or chemicals required. You cannot get better than that, in my opinion, and they are DELICIOUS! Our cottages are open all year round, but a lot of eating places close or partially close in the low season. Check with each establishment to find out their opening hours.